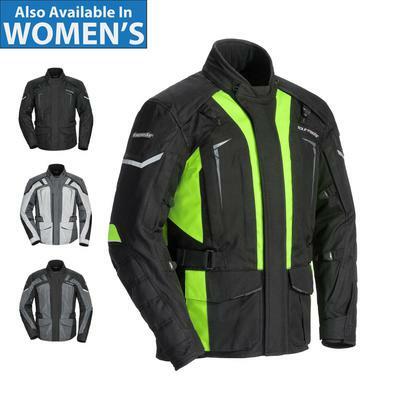 A proper touring jacket must serve multiple purposes as no two days or roads are alike. Transitioning from one climate to another demands different features and the Transition Series 5 delivers. From a cold early morning ride to a humid afternoon ride, opening up the Pipeline vents to maximize airflow. Should your ride go from warm to downright wet and cold, the jacket's Rainguard barrier, along with the waterproof zippers on the Pipeline vents, and the removable insulated liner will keep you dry and cozy. For further weather protection, the Transition 5 jacket also features Tour Master's patented Aqua-Barrier Under-The-Helmet Hood deploys from the collar. Worn over your head and under the helmet the Aqua-Barrier hood will prevent rain from seeping down the back of your neck.